Patriot troops, 18 January 1795. The Batavian Revolution (Dutch: De Bataafse Revolutie) was a time of political, social and cultural turmoil at the end of the 18th century that marked the end of the Dutch Republic and saw the proclamation of the Batavian Republic. The period of Dutch history that followed the revolution is referred to as the "Batavian-French era" (1795–1813) even though the time spanned was only 20 years, of which three were under French occupation. By the end of the 18th century, the Netherlands found themselves in a deep economic crisis, caused by the devastating Fourth Anglo-Dutch War. During this time, the banks of the Dutch Republic held much of the world's capital. The government-sponsored banks owned up to 40% of Great Britain's national debt. The people of the Netherlands grew increasingly discontent with the authoritarian regime of the stadtholder, William V. This concentration of wealth led to the formation of the Dutch Patriots by a minor Dutch noble named Joan van der Capellen tot den Pol, who were seeking to reduce the amount of power held by the stadtholder. Thus, a division emerged between the Orangists, who supported the stadtholder, and the Patriots who, inspired by the ideals of the Enlightenment, desired a more democratic government and a more equal society. The Patriots built support from most of the middle-class, and founded militias (Exercitiegenootschappen) of armed civilians which between 1783 and 1787 managed to take over several cities and regions in an effort to force new elections which would oust the old government officials. The Patriots held Holland and the city of Utrecht, while the Orangists held the states of Guelders and Utrecht (outside of its capital city). 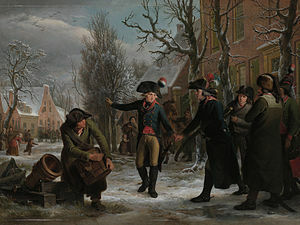 In 1785, stadtholder William V fled his palace in the west of the country for Nijmegen in the east, as the States of Holland were not willing to send their troops to fight the Patriots. In May 1787, the stadholder's troops were defeated by the militia of Utrecht near Vreeswijk. When Princess Wilhelmina was stopped by patriot militia near Goejanverwellesluis on June 28, 1787, she applied to her brother Frederick William II of Prussia for help. On September 13 a Prussian army of 20,000 men under the command of Duke of Brunswick crossed the border. The fortress of Vianen was deserted, and the city of Utrecht opened its gates. At the fortress of Woerden preparations for defense were made, but there was no actual resistance when the Prussians arrived. In Amsterdam several houses of patriot regents were plundered by mobs. The stadholder returned to Gravenhage, and Amsterdam, the last city to hold out, surrendered on October 10. The Patriots continued urging citizens to resist the government by distributing pamphlets, creating "Patriot Clubs" and holding public demonstrations. The government responded by pillaging the towns where the opposition was concentrated. Most Patriots went into exile in France, while Orangists strengthened their grip on Dutch government chiefly through the Grand Pensionary Laurens Pieter van de Spiegel. 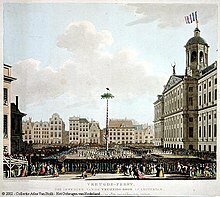 Erection of a liberty tree on Dam Square in Amsterdam after the proclamation of the republic. The Batavian Revolution ended with the proclamation of the Batavian Republic in 1795. William was forced to flee to England, where he issued the Kew Letters proclaiming that all Dutch colonies were to fall under British rule, as they had declared war on the Batavian Republic. A number of these colonies, such as Sri Lanka and the Cape Colony, never returned to Dutch rule, although the Cape did so temporarily between 1803 and 1806. Several coups followed in 1798, 1801 and 1805 which brought different groups of Patriots to power. Though the French presented themselves as liberators, they behaved like conquerors. The Batavian Republic saw its end in 1806, when the Kingdom of Holland was founded, with Napoleon's brother, Louis Napoleon as King of Holland. In 1810, the area was annexed into the First French Empire. In 1813, the Netherlands regained their independence, with William's son William Frederick as sovereign prince. Danielle Aucoin. The Dutch Patriot Revolution 1780 – 1787:Continuity or Change? Klein, S.R.E. (1995) Patriots Republikanisme. Politieke cultuur in Nederland (1766-1787). Leeb, I.L. (1973) The Ideological Origins of the Batavian Revolution. Verweij, G. (1996) Geschiedenis van Nederland. Levensverhaal van zijn bevolking.